Deep root fertilization is a process where a high quality nutrient solution is injected into the root zone of trees. The materials are injected into the root zone under pressure which helps aerate or provide much needed oxygen to the root system. 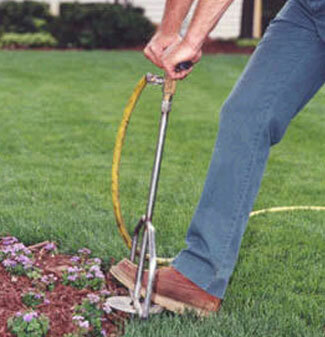 The soil injection begins just below the surface and goes to a depth of twelve to fourteen inches. Soil injection sites are placed two to three feet apart in a grid pattern under the canopy area and beyond the drip line. Normally, fertilization programs should be repeated once or twice a year. There will be instances where severe root damage has occurred, soil compaction exists, or other health problems are present. In these instances, it may be recommended to increase the frequency in order to improve conditions in and around the root zone which can improve overall health and vigor. Roots are opportunistic and develop where ever oxygen, nutrients, and moisture are present. Ongoing deep root fertilization programs improve the oxygen content, microbial activity, and nutrient levels within the soil, leading to improved environmental conditions around and within the root zone.